Games that thrust players into close quarter battles are a lot of fun. They require a great deal of tactical thinking to come out on top. If you are an avid fan of this genre, then MaskGun on PC might pique your interest. This first-person shooter (FPS) doubles up as a multiplayer battle arena (MOBA) game. You get to face off against actual people in real time. Everyone goes into the battlefield armed and the goal is to get the most kills within a limited time. 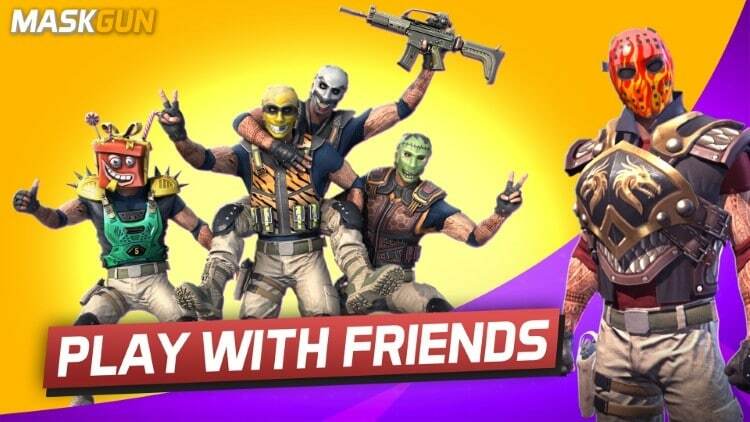 Team up with friends and strangers, go at it solo in Deathmatch battles or try the bomb defusal mode. Whatever challenge you fancy, be prepared to tap into your inner solder. MaskGun offers some nice options to customize your combatant. To begin with, the weapon you can take into battle is not fixed. Plays can equip an assault rifle, SMG, sidearm Glock, sniper rifle or heavy gun. There are even knives and other melee weapons you can unlock to fight off enemies in close proximity. Besides weapons, there are masks and body armor vests to acquire. Gold and diamond rewards earned from completing missions will help you to buy new gear. However, most items become available for purchase as your level up. So, you have to keep playing if you want to unlock new gear. MaskGun treats players to 3D simulated battlefields with excellent visuals. Currently, the game offers five maps, namely the Light House, Diwali Yard, Ghost Town, and Ryokan. The developers at June Gaming Studio have promised to roll out more locations with future updates. However, simple controls are perhaps what most players will find appealing about this game. There is an auto shooting function, so you only need to worry about navigation and aiming. And, with the help of a mobile emulator, playing MaskGun on PC is just as enjoyable as the experience you get on touchscreens. The mini-map found on the top left of your screen can be quite useful when planning your move on enemy teams. Use it to locate other players on the arena. Red dots represent the position of your opponents. On the other hand, teammates appear as white moving dots. It is easy to get shot down when you are outnumbered. In such situations, the best strategy is to take out multiple enemies at once. That’s where the hand grenade comes in handy. To inflict maximum damage, make sure to be accurate and hurl the grenade in good timing before the enemies move out of the blast radius. MaskGun rewards new players with a daily login reward. This offer spans the first 7-days after installing the game. You don’t even have to play. Simply log in and claim your reward. From gold and gems to grenades and medkits, you will find some nice free resources up for grabs. If you want your weapons to serve you better in battle, then make sure to upgrade them. For instance, you can spend gold to increase gun stats such as clip size, damage, fire rate, & range. A great way to get many kills is by eliminating enemies as at their re-spawning area. Simply choose a good vantage point where you can attack and take cover. Do this right and you can kill opponents over and over again as they resurrect to rejoin the battle. Go to the search box in Bluestacks and type “MaskGun” without the quotes, of course. That is it! You can now enjoy your freshly installed copy of “MaskGun” on your favorite PC!